With its progressive and expansive "left coast" horizons, L.A. may soon beat out New York City — if it hasn’t already done so — in the amount and quality of art by African Americans that it shows. Here’s a sampling of what’s been happening here during the summer and fall 2015 seasons. With his Resurfaced + Restructured exhibition at Reginald Ingraham Gallery, Sept 12 - Oct 17, 2015, Eric Mack, the well-known, Atlanta artist, moves one step closer to achieving a well-deserved national exposure. Specializing in works by modern and contemporary African American artists, the Reginald Ingraham gallery has moved around L.A. several times since opening in 1998. Closed for a while, it seems finally firmly anchored in its current location in the West Adams arts district. 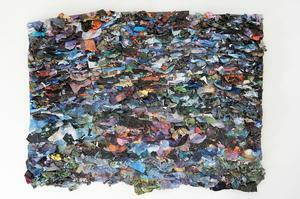 Artists who have shown at its various sites include Mark Bradford, Maren Hassenger and Alexandria Smith. Ingraham’s showcase of Eric Mack coincides with other current recognitions of this artist’s outstanding talent including the Director's Award for Best in Show at the Athens (GA) Institute for Contemporary Art’s annual juried exhibition in September 2015. “Eric Mack talks about art as if he is ready to ‘bust a move,’ go somewhere, do something; like his art work, he is filled with energy,” wrote Gylbert Coker when IRAAA+ profiled the artist in 2014. Mack’s indeed “ready to go somewhere” — like from Los Angeles to a solo show in New York or Chicago. includes works in depth by several well-known African American artists including Jean Michel-Basquiat, Mark Bradford, Glenn Ligon and Kara Walker — numerous works by each of these artists. The gallery of Glenn Ligon's work was highlighted in a review of the Broad’s inaugural exhibition. 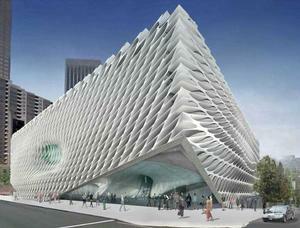 The Diller Scofidio + Renfro building itself adds another striking, sculptural design to the Grand Avenue cultural landscape. Ricardo Scofidio, a principal of the high-profile architectural firm, Diller Scofidio + Renfro, has stated that he is biracial (of Carribean descent). The firm’s design for the University of California, Berkeley Art Museum/ Pacific Film Archive (BAM/PFA) is currently under construction. Teamed up with architect Mabel O. Wilson (who is profiled in IRAAA, Winter 2015), the firm was a finalist for the design of the African American History and Culture Museum in Washington, D.C.
Glenn Ligon also has a show at Regen Projects in West Hollywood through October 10, 2015. 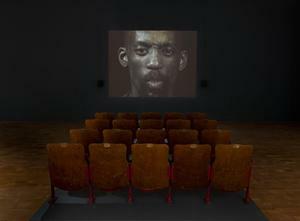 His installation, Live, incorporates video imagery from "Richard Pryor: Live on the Sunset Strip (1982)” — just fragmented video with no sound. 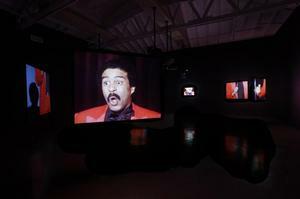 The silent fragments emphasize the physicality of Pryor’s comedic talent. 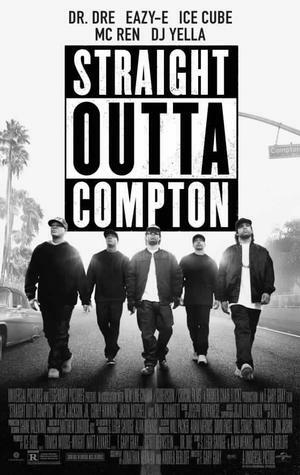 Released on August 14, 2015, the movie “Straight Outta Compton” profiles not just N.W.A., but Compton as key to the history of rap. 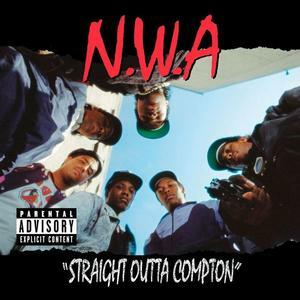 The album “Straight Outta Compton” was released in 1988 jump starting the California rap scene. Since then, Compton has been promoted within rap music and videos establishing the city in the national consciousness. Today, Kendrick Lamar, a rap artist from Compton, has taken the lead in updating the city in the national spotlight. 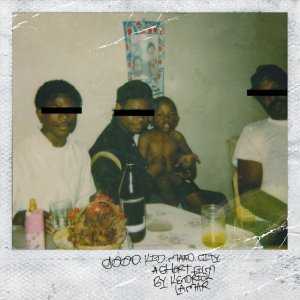 After his 2012 “Good Kid M. A. A. D. City” concept album which was billed on the cover as a "short film" because of its vivid, narrative autobiographical journey through Compton, Lamar enlisted art filmmaker Khalil Joseph to provide visuals for his concerts. Khalil Joseph debuted the actual M.A.A.d short film at the 2014 Sundance Next Fest. Reworked, Joseph’s video “M. A. A. D.”, with music from Lamar, was the basis of the Museum of Contemporary Art (MOCA)’s Khalil Joseph's Double Conscience exhibition, March 20, 2015 – August 16, 2015. The brief overlap of Khalil Joseph's exhibition’s and the release of the “Straight Outta Compton” film missed an opportunity to reflect on how both rap and visions of Compton have changed. Still suggesting a biography, Joseph’s Double Conscience film begins with old footage of a baby (Lamar?) along with Lamar’s name and birthdate. However, with the remainder of the film a montage of sustained shots of people outdoors, it takes on the air of “a day in the life” study. This insider’s view is a radical departure from the traditional presentation of Compton as a display; be it violent, resourceful, of flush with leisure. This was most apparent from the installation’s single row of benches in the moment Joseph positions the camera behind the driver and passenger in the front seat of a car. As they drive, they are seen from the vantage of a backseat passenger: Compton is visible through the windshield, and Lamar’s music plays on the radio. The film’s engagement with Lamar’s music develops a strong allure. One of the most memorable shots of the film occurs in the opening sequence. A man hangs by his ankles upside down from a streetlight. It is dusk; the sky, a deep hue. The man seems more bat than vampire. Absent of threat, the scene is, nevertheless, full of foreboding. Joseph’s achievement is conveying a subjective experience. From this vantage, Compton, in addition to the disruptions of gun violence, contains the pleasure of riding a horse full speed down a lamp lighted street. Khalil Joseph is the brother of the painter and installation artist Noah Davis who passed on August 30, 2015. 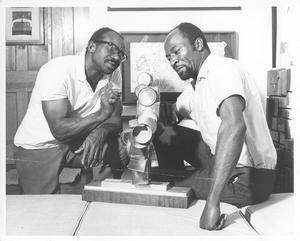 The brothers often collaborated on projects. Noah Davis' Imitation of Wealth is at MOCA Grand Avenue, August 29, 2015 – February 29, 2016. A remembrance of Noah Davis is here. MOCA’s recent 2015 offerings also included William Pope.L: Trinket. While the artist William Pope.L had more obvious connections to Kahlil Joseph: Double Conscience relative to the African American experience, the work of the white, female artist Sturtevant also resonated with the other two in its attention to public iconography, like the U.S. flag. William Pope.L: Trinket offered several works arranged as a kind of darkened fun house replete with labyrinthine entrance. Viewing Pope.L’s Snow Crawl required climbing a staircase, providing a new perspective on this video installation that was begun in 1992. 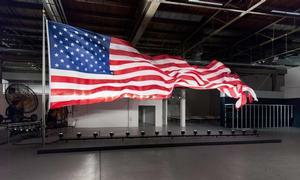 The central work of the show was a huge American flag that was blown by giant fans, causing it to rip into strips at its right end. The installation provided a state-the-nation, visual commentary. 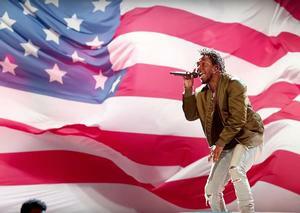 Kenrick Lamar riffed off of his deepening MOCA connections at the BET Awards on June 28, 2015 when he performed in front of the flag from Pope.L’s Trinket show. 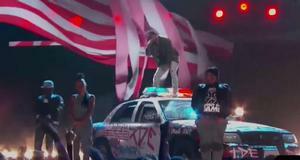 He stood on top of a graffiti covered police car, exhorting with his rap hit, "Allright," as the flag violently waved, making explicit the connection between Pope.L's critique and police violence. Hip hop culture meets installation/performance art. 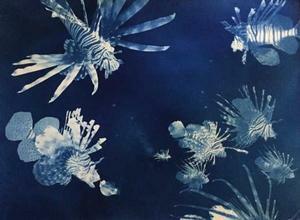 MOCA other recent showcases of leading-edge black artists included, at the Pacific Design Center, Tongues Untied, June 6, 2015 – September 13, 2015. Tonques Untied featured screenings of Marlon Riggs’ groundbreaking 1989 film on the gay black male experience. Shown in a space with school auditorium chairs, the documentary no doubt schooled many viewers on this topic. The film was accompanied by works by other artists responding to the AIDS epidemic. 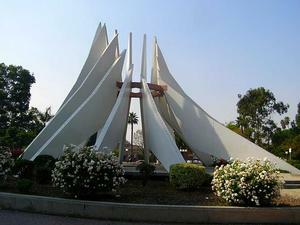 The Compton memorial to Martin Luther King, Jr. appears in M. A. A. D. The dynamic sculpture by Gerald Gladstone and Harold Louis Williams consists of a circle of white concrete ribs converging in the air. Harold Louis Williams, F.A.I.A. (1924 -2015) passed on June 21, 2015. Williams was the ninth African American to become a licensed architect in California. He designed Compton City Hall and Civic Center (1976-1977), where the memorial is located, as part of his firm Kinsey, Meeds & Williams. He intended the complex to impart a sense of civic identity. Williams worked to involve other minorities into the architectural field. 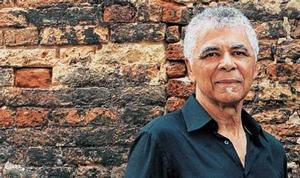 He was a founder and president of the National Organization of Minority Architects. 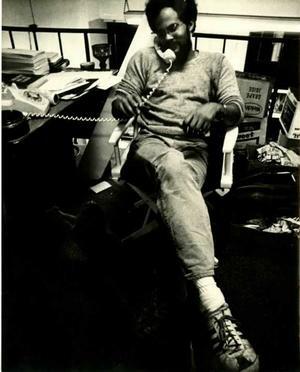 He was active in his community, including leading efforts to preserve Simon Rodia’s Watts Towers. The Watts Towers Art Center opened in 1964 and its first director was Noah Purifoy. Purifoy’s work was on view in Noah Purifoy: Junk Dada at the Los Angeles Country Museum of Art, June 7 - September 27, 2015 and reviewed in IRAAA+. In LACMA Brings Noah Purifoy Out Of The Desert, IRAAA associate editor John Welch discusses a number of mental and spiritual contexts of Purifoy’s life and work including the disillusionment that prevented him from doing any artwork for 11 years. 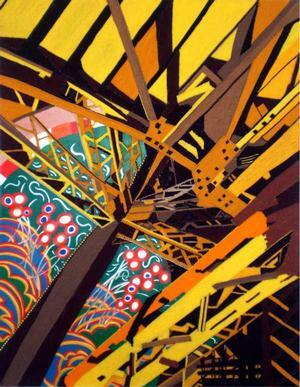 Of note, Harold C. Williams led the construction of a new building for Watts Towers Art Center in 1967. The work of another former Watts Towers Art Center director also was on view in L.A. this year — Mark Steven Greenfield who directed the Center in the 1990s. Greenfield had a solo show at the California African American Museum, September 25, 2014-July 5, 2015, Looking Back in Front, which was covered in the IRAAA+. August 2015 marked the 50th anniversary of the Watts riots. The film “Wattstax” (1973) presented the Wattstax 72 concert as the musical reaction to the riots. 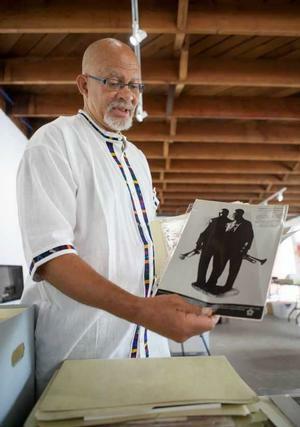 One of several Los Angeles Times articles revisiting the Watts riots in relation to the arts, Gerrick D. Kennedy discussed the concert and film in relation to current events. 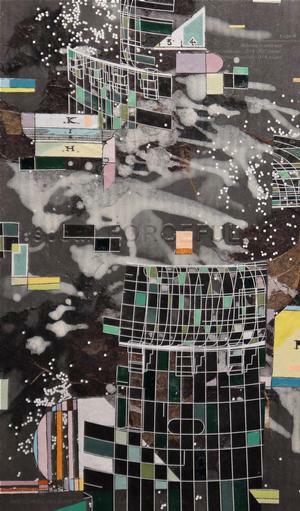 “Mark Bradford: Scorched Earth” at the Hammer refers to the 1992 L.A. uprising and its aftermath and includes new paintings (on view through September 20), a multimedia installation (on view through September 27), and a major painting on the Lobby Wall (on view through November 15). At the California African American Museum: Hard-Edged: Geometrical Abstraction and Beyond, August 13, 2015 - April 24, 2016. 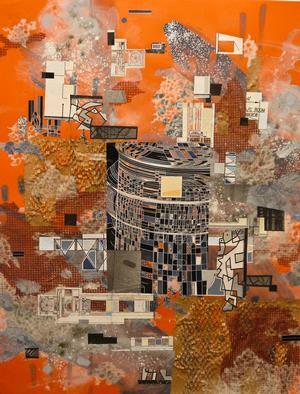 This exhibition of geometrical abstraction in a variety of media by artists of African descent — painting, assemblage, installation, photography, video, quilting, and mixed-media works — demonstrates how an African American museum that, unlike a number of other L.A, institutions, is not endowed by wealthy benefactors and patrons, is never-the-less, able to mount astutely curated exhibitions. The artists represented in the show range from senior master artists such as David Hammons to mid-career and emerging stand-outs such as Erick Mack and Nzuji de Magalhaes. 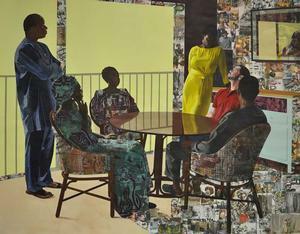 Njideka Akunyili Crosby (b. Nigeria, 1983) and winner of the prestigious, Smithsonian American Art Museum’s James Dicke Contemporary Artist Prize, continues her visual narrative about the romance she shares with her American husband and other domestic topics in The Beautyful Ones at the Hammer Museum's Art + Practice site in Liemart Park, October 3, 2015–January 10, 2016. Concurrent with the Akunyili Crosby show are screenings of two films by Akosua Adoma Owusu, an Alexandria, VA-born filmmaker of Ghanaian parentage whose arts have shown worldwide. Previously at Art + Practice: art works and items from projects by this year’s artists-in-residence – Aalia Brown, Dale Brockman Davis, and Sandy Rodriguez – were on view through August 29, 2015. 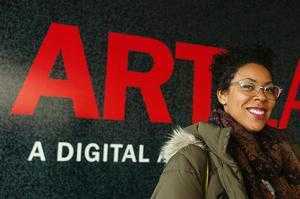 Mark Bradford founded Art + Practice in 2014 with the philanthropist Eileen Harris Norton and the social activist Allan DiCastro to combine the support of art with useful community services like job training. During his Art + Practice residency, Dale Davis worked on his the Brockman Archive project — preserving primary materials from the Brockman Gallery that he operated with his brother, Alonzo, from 1967 and 1989. Numerous now-noted artists showed at the gallery including Betye Saar, Noah Purifoy, John Outterbridge, and David Hammons. The former Brockman Gallery site is now, very appropriately, occupied by Art + Practice. 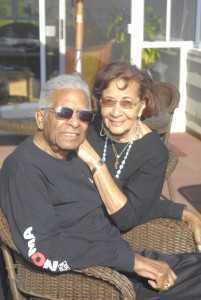 IRAAA contributing writer Elizabeth A. Watson is based in San Diego, CA.